Wigan Warriors' two-point deduction for salary cap breaches has been suspended until March 2020 following an appeal. The Super League champions will have two points added to this season's total immediately, moving them off zero points and up to 10th in the table. They have been fined £5,000 and told to pay £2,000 to cover the costs of their original tribunal hearing in January. The penalty relates to six separate payments totalling £14,700 in 2017, not declared to the Rugby Football League. The Warriors will be deducted two points if they breach the salary cap again in the next 12 months. Wigan chairman and owner Ian Lenagan said the club could now "draw a line under the issue" after their appeal was heard on Tuesday by a panel appointed by Sports Resolutions, an independent dispute arbitration service. The club previously claimed their breach "did not affect the competitive balance of the competition", having finished sixth in Super League in 2017 as well as losing to Hull FC in the Challenge Cup final. "We are pleased the panel have reached what we have always believed to be the correct decision," Lenagan added. "Throughout this process we have acknowledged the administrative errors that resulted in this technical breach and I'd like to say again that we apologise unreservedly for the errors and accept a fine of this level is justified. "Our main argument has been that a points-deduction punishment was disproportionate to the marginal nature of the offence committed. "Hopefully the findings of this case can act as a catalyst for change on some of the operating procedures regarding salary cap management which are clearly necessary." The RFL and Wigan had already agreed to split the cost of the hearing, and Sport Resolutions also ruled Wigan's appeal deposit should be retained by the governing body. An RFL statement said it was "good" to have the matter resolved, and it would "continue to police the salary cap in agreement with the Super League clubs". 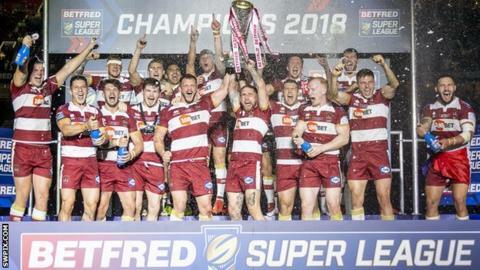 Super League clubs were limited to a salary cap of £1.825m in 2017, which rose to £1.9m in 2018 and £2m this year.